Once upon a time, the larvae of the Caddis Fly were considered pretty unassuming creatures, freshwater dwellers whose appeal was limited to trout and trout fishermen. That is until French artist Hubert Duprat came along with an aesthetic offer they couldn't refuse. Left to their own devices, Caddis larvae construct protective cases from natural materials found in their habitat, patching small pieces together with silken thread. A chance encounter with some prospectors at a river in southwestern France led Duprat to wonder how the Caddis larvae might adapt if gold figured more prominently among their building supplies. Thus began The Wonderful Caddis Worm: Sculptural Work in Collaboration with Trichopteras, an ongoing artistic experiment in a carefully controlled, scientific setting. Basically these birds are spinning their own gilded cages with whatever luxury materials Duprat introduces into their artificial environment. 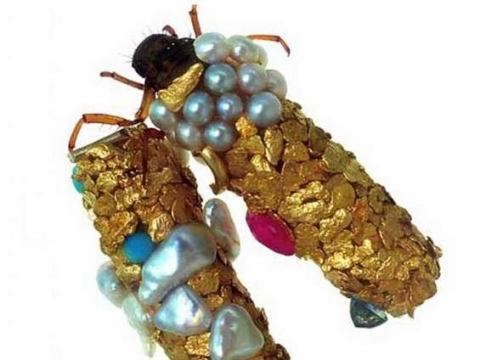 The resulting jewel encrusted creations would not be out of place in a Madison Avenue window, though it's possible a nearsighted dowager might mistake the tiny jeweler for a cockroach. Whether or not one would opt to wear one of these blinged-out insect casings were money no object, one has to admit their engineering is a most unusual feat. It would make for one humdinger of a Science Fair project if only Duprat hadn't patented the technique in 1983. So he patened the idea of providing materials to an animal or insect to do his work? Doesn’t a patent expire its been 30 years?